We’re finally at the last part of our exploration into personality types and play styles around Bartle’s player taxonomy; the Killer. Though this one is slightly different, as many of the other player types are generally positive or individualistic player types, the Killer is somewhat negative. That is why for better understanding it has been paired with its opposite the Philanthropist. If you haven’t read Part 1 (The Achiever), Part 2 (The Explorer) and Part 3 (The Socialiser) in the series, then I do recommend having a look through them as well, as they will fill out the blanks for you in the piece. 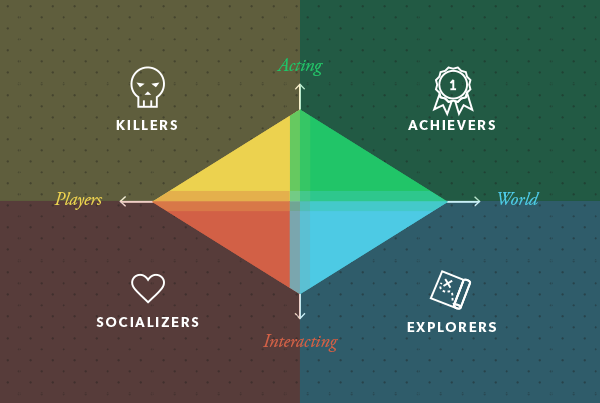 As you may know by now with this series, we’re looking at and breaking down one of the more famous Player Type models, Bartle’s Player Type taxonomy, which splits people into four categories: Achievers, Explorers, Socializers and Killers (Philanthropists). There are other variations and expansions of this model from Lazzaro, Callois, Kersey, and other psychometric tests, many of which are explored in detail in this Gamasutra article. The idea of the player type model is that they may or tend to be incomplete, this notion arises because people exist out of more than just one type of personality type. People are a bit more complex than just a singular label. As Bartle has mentioned himself, his own model may be too narrow in certain circumstances, and this leads us to consider that the other model may also not be broad enough. Though we don’t want to go to the other end of the extreme and create one that is too broad. Then we simply lose oversight and create a model that is made of only exceptions and no rules. One of the aims of this series to use the narrow model created by Bartle to explain the base types found in the majority of people and to then see if perhaps a more classic and broader taxonomy such as Jung’s Archetypes can be added in to give a varied and expanded viewpoint on player types. To do this effectively a careful qualitative research of your target community should be conducted. This is so that when you design your game or gamified system, you can accurately determine which types are dominant and which types you should cater for in each player. What you must remember is that these player type models do not exist to put people into neat little boxes, but to create a better understanding of all the varying interests and priorities in each person, and to give these needs, wants and motivations a recognizable label. The other aspect to remember as a designer is that if you’re not careful, your game or gamified environment may inadvertently lean towards a certain player type. But through rigorous qualitative research, you can overcome this by understanding your audience and creating a more holistic environment. Thereby increasing the overall interest and engagement of your audience. And that is generally what we all aim for as successful designers. As the player types are simply labels for what individuals will priorities in their play experiences, then each person will also have a dominant player type depending on the environment they find themselves in. Depending on the game or gamified environment, each experience withdraws out different personality types. Therefore, remember which demographic you want to aim for and which player type you want to design for. As Bartle has said, his model was based around MUD’s (Multi-User Dungeons), thus the theory is based on what players want from multiplayer game experiences. Player type models, in general, are designed to determine what people find fun and what objectives they enjoy. Not to mention what type of agency will be evoked in them towards the goal that you have created. Despite that Bartle’s model was aimed at MUD players, it is one of the most straightforward and simplest models to start from. Therefore, we will use it as a base point of reference, to avoid creating too many analysis and losing track of the many varying player types. The last player types then that we will explore is Killer/Philanthropist. This type of player is most at home when they are acting on other players, such as player versus player combat, competition, active cooperation. Bartle talks about Killers, other models have added Philanthropists, though I feel that they are simply different sides of the same coin. The motivation behind the Philanthropist is generally altruistic, a want to give back and enrich lives, whereas Killers are generally selfish, and have a want to take as much as they can. Both have an intrinsic need for competition and empowerment, the difference arises from the means they use to achieve this and where they find it. Either way, both sides of the coin wants to be recognized by others as the strongest and/or most knowledgeable of the game or gamified system. Perhaps the best way to differentiate between the two types is that the Killer enjoys being the winner and knowing that there is a loser. This is usually achieved in environments designed to have zero-sum outcomes. The Philanthropist, on the other hand, enjoys being the top (guild) leader or perhaps the top trader who has cornered the market in a collaborative game environment. When adding in the other player types, Killers and Philanthropists thrive off Achievers. 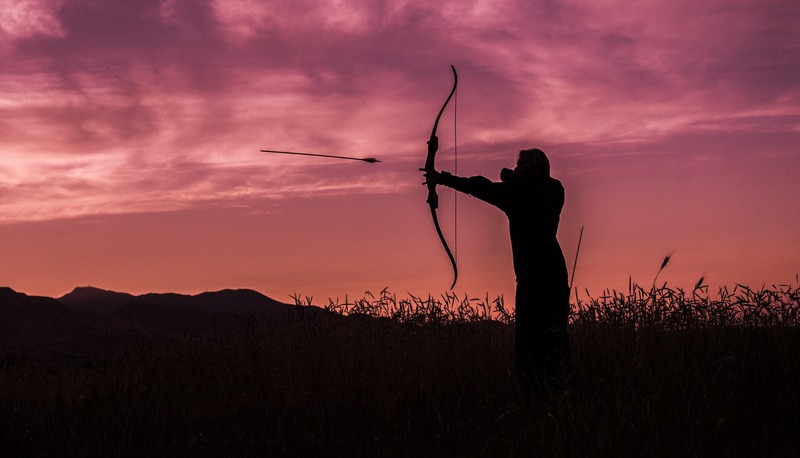 Achievers generally outpace Killers in content, but thanks to the Achievers, and by association, the Explorer, Killers, and Philanthropists will be able to access new content thanks to them. Beyond that, the Achiever offers good competition and cooperation for each aspect respectively. You will want to cater to both Killers/Philanthropists and Achievers as having these two player types will offer an equilibrium so that one doesn’t purely dominate your environment. When it comes to Socialisers, Killers are a good way to keep this group in check to ensure that progress is still made within your content. As will Philanthropists as they will facilitate progress, as opposed to Killers who force it. As a designer though you must keep one thing in mind when adding in content that attracts the Killer/Philanthropist type. If a Killer becomes bored in your game or gamified experience then they will slowly become a toxic element that will stir up issues to simply create competition or excitement for themselves. Therefore, you need to ensure that the content is either varied enough or focused enough to engage each player type correctly and facilitate their continued progress. To avoid anyone becoming bored. Reading the previous piece, you may think well why would I want a Killer type in the experiences I’m designing, a Philanthropist maybe. But as we’ve seen the elements that attract one attract the other. They both wish for competition, just the outcome is different. And that is the main point, this player type engages in competition, in all its variations; from friendly to kill or be killed. The Killer/Philanthropist is an integral aspect of any experience I would say. They are the ones that directly or indirectly facilitate progress in all other player types. The Killer pushes themselves and others to be better, either through beating them or being so good at something that you can avoid them completely. The Philanthropist in that sense aids other player types through vision and opportunity to achieve new heights to progress in their own goals or to usurp the Philanthropists top-dog position. Creating an environment, therefore, that attracts these types of individuals is fairly straightforward then. All you need to do is create one where people are able to better than their peers and opponents. Much like the Achievers environment, wherein the internal reward of knowing you are number one, the Killer/Philanthropist wants the external reward of having everyone know they are a winner. In terms of where these types of people are in the overall progress of your designed experience /journey, they live in every stage. Anywhere where they can prove they are better than someone they will remain there. This is both a boon and a curse. The boon is that it pushes other people to progress further, the curse is that the Killer/Philanthropist may choose to remain and not progress and as they are number 1 in that stage. This can lead to a blockage, as they will become experts in the middle, dividing your experience. To avoid something like that happening you need to devise a mechanic that forces them to move. If you have a game to displays achievements of Killer oriented progress, such as Kill/Death/Assist ratio, then implementing a seasonal reset will allow new players to move past these individuals and hopefully motivate the Killers to improve to progress themselves. You may think that Philanthropists wouldn’t suffer from this, as for why would they want to stay in a middle stage simply to prey on easy targets. But don’t forget that certain individuals, despite being altruistic, will simply want to stay in the stage that is the easiest for them to be altruistic. These players are the also not progressing as they can do the minimum required action to feel good about themselves and others, but in reality, not have to work hard to progress through your content, which is also not what you want. The mechanics to combat these are luckily the same as combatting the Killers blockage. As we have seen, both want external recognition, and once that is reset within a socially acceptable time period, they will move on. As you can see at the start the Killer is fundamentally seen as a negative disruptive force in a game or gamified experience. The Philanthropist, however, is seen as a positive collaborative force. But what must be reiterated is that they are still two sides of the same coin. You must see this personality and player type as a facilitator of motivation and progress. Even those that are not competitive or collaborative will be pushed or forced to take on aspects of those personality types to maintain their own chosen experience. A Socialiser will for a brief time become competitive, progress and achieve the next stage in their journey, either to prove they are better or to avoid the repeated actions of a Killer. An Achiever who is traditionally a solo individual will collaborate with the Philanthropist to gain the means and tools to get that next game first achievement. And this is also true of the Explorer. In essence, the Killer/Philanthropist type is its very core, the engine of your design. Without them, the overall experience would become singular for all the other player types. Once each has gotten to the point they are comfortable with, they would cease to have the motivation to continue in your game. The Killer/Philanthropist, therefore, forces you and your players to keep trying anew, to keep setting new goals, to keep resetting perceived limitations and to keep pushing forward.